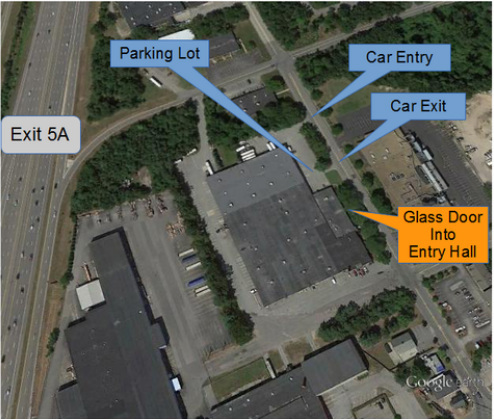 Our design office and fabrication facility is conveniently located just off Exit 5A (Simon St) driving north on the Frederick E. Everett Turnpike (US 3). Take exit 5A, then turn right onto Simon Street at the stop sign. Travel about 150 feet to the first driveway on the right. Enter the driveway and immediately turn left into the large parking area. Park and walk towards the brick front part of the large building complex. Walk along the sidewalk, bordering Simon Street. The first glass doorway is the main entrance to SSSC. The greater Nashua, NH area has many lodging choices. Those off Frederick E. Everett Turnpike (US 3) provide quick and easy access to our facility off exit 5A.